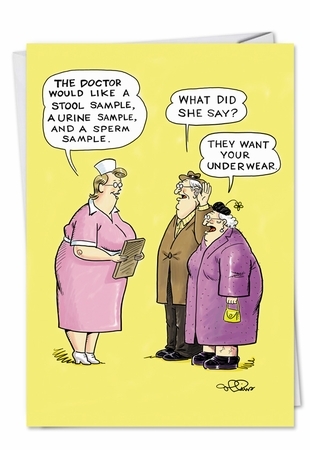 Cover Reads: The Doctor Would Like A Stool Sample, A Urine Sample, And A Sperm Sample. What Did She Say? They Want Your Underwear. Inside Reads: Listen Carefully: Happy Birthday! Paper Stock: Mixed sources pulp from well managed forests, controlled sources and post-consumer recycled fiber. USA Made..